NextGen’s Gorilla Go Wild slot is a brilliantly animated 3D experience which must be seen to be believed. Gary the gorilla is our partner in crime throughout the whole game and is a fun partner to have. He keeps us company in the cartoon jungle he calls home. Reminiscent of a Pixar character Gary is quite entertaining, gesturing when a big jackpot is won or even eating bananas as part of the progressive bonus feature in the game. I’m pretty sure Gary’s just hungry and uses the bonus feature round as an excuse to eat more bananas. 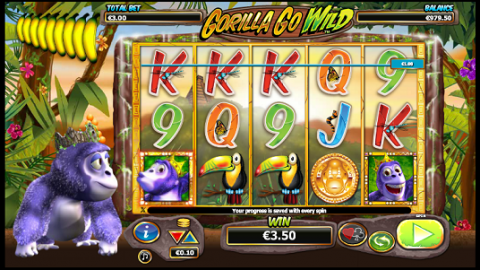 Gorilla Go Wild is a 5 reel 25 payline progressive slot with a minimum bet per line of 1c and a maximum of €2. It’s has many bonus features that can be unlocked in normal play, awarded at random by Gary or achieved through the progressive element of the game. The symbols to look out for are Gary who is the wild, substitutes for every other symbol except the scatter, and the pyramid which is the scatter. 5 Gary symbols will give you a 1500x multiplier while 5 pyramids will give you a massive 2500x multiplier. 3 or more pyramids also award you the bonus feature Gary’s Feature Kingdom where you can select one of four free games. There are 4 other high paying symbols. For 5 matching symbols the gold coin awards a 1000x multiplier, the purple monkey awards a 500x multiplier, the Toucan bird awards a 250x multiplier and the grey monkey awards a 150x multiplier. Not forgetting the playing card symbols. The Ace and the King have a 100x multiplier for 5 symbols with the top prize incrementally lowering by card strength for the others. Buckle your seatbelts, there are many features to go through in the Gorilla Go Wild slot. Gary can award this at random after a spin. It could be a prize of anything from a 50x multiplier to a 1000x multiplier or it may be an entry to Gary the Gorilla’s Feature Kingdom. Gary may decide at any time to eat one of his bananas. When there are no bananas left he will move to a different part of the jungle, he does this three time in total. Every time he moves the frequency of being awarded Gary’s Bonus Time increases. This is the progressive nature of the slot. The more you play the more likely you are to be awarded bonuses so the RTP (return to player) percentage increases. There are two ways to hit this feature. Either get 3 or more pyramids or get awarded it by Gary in Gary’s Bonus Time. Once you are awarded this feature you have to choose from four other bonus feature listed below. This is the second progressive part of this slot as the more you trigger Gary the Gorilla's Feature Kingdom the more games become available to play and the bigger the possible prizes. This bonus feature is available after your you trigger the feature kingdom the first time. 10 winning spins are awarded with a 2x multiplier of all winnings. Gorillionaire Win Spins Feature can be retriggered only once, Gary decides whether this happens. This option is available after you trigger the feature kingdom 5 times. 10 free spins are awarded. Any Wild that appears is sticky and will be held in that position for the remaining free spins. Stay Wild can be retriggered once. Available after you trigger the feature kingdom 10 times. 10 free spins are awarded and the winning from these are multiplied by the Free Games Multiplier. This starts at 1x but increases up to a maximum of 10x depending on how many wilds appear. This feature can be retriggered. This last feature is available after you trigger the feature kingdom 15 times. Again 10 free spins are awarded. For each free spin every time you hit 3 matching symbols, excluding the temple, they change to wild. The More Wilds feature can be retriggered once at Gary’s discretion. All of these feature games are exciting to play for their own individual reasons. I particularly like the stay wild one, if you are lucky like me you’ll hit many wilds on your first spin and watch as your prize gets bigger and bigger. I should also mention the Gamble Feature that NextGen have on most of their slots. You can gamble any win by hitting the small button next to the spin icon. Either select the colour of the next card to double your money or select the suit of the next card to quadruple it. Gorilla go wild is an excellent slot to play. NextGen have outdone themselves in both its design and gameplay. With so many bonus rounds to unlock and the comical Gary to keep you company I can see this slot being revisited many times. Hitting big prizes is fairly regular so no need to worry about your money decreasing very fast. 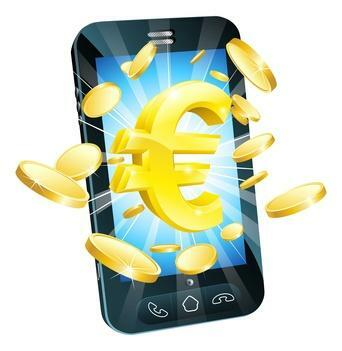 Plus the more you play the more features you will trigger and this means more big payouts. Try your hand at becoming a Gorillionaire today at the acclaimed (and always stylish) Mr Green Casino - www.mrgreen.com.